Folyes sent me one of their new hardbound A5 notebooks to test and review here on the blog. All thoughts expressed in this review are entirely my own. 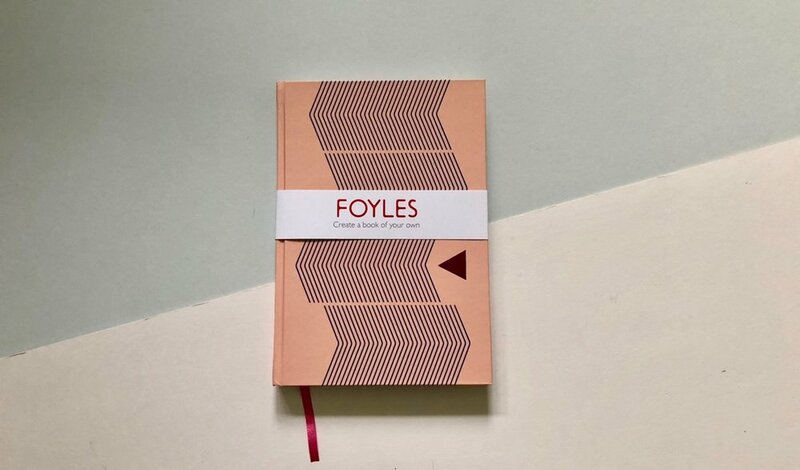 I wasn’t aware that Foyles had their own range of stationery items so it was a very nice surprise when they contacted me asking if I’d like to check out their new A5 notebook. Folyes has always represented quality to me and their stores have a good range of stationery items, so I had high hopes for this notebook. There are four different colour options available with this notebook but for this review I opted for the Blush version. It has a hardbound cover with a geometric design. The cover design continues onto the inside with more flare. With the Blush notebook there is a sort of blue chevron design with some hot pink foiling. The notebook is ruled with a light grey ink on cream coloured paper. Personally I enjoy using paper which is off-white or cream as I think it’s less harsh. The ruling in these notebooks doesn’t run the full width of the page but leaves a small boarder around the side. The ruling width is good giving you plenty of room if you have larger handwriting. Each page is numbered, however there is no index at the front of the notebook which kind of makes this addition a little less functional. Finally there is a thin ribbon style bookmark in a hot pink to match the foiling on the front of the notebook. Using the notebook and paper quality. The design of a notebook is important. Quality materials and a strong design always make them far more appealing but really the paper quality is the selling point. It’s no use having a gorgeous notebook if the paper is poor. With the Foyles notebook I tested out a range of different writing tools I would typically use everyday to see what it could take. This ranged from fountain pens, pencils, drawing pens, gel pens and liquid ink pens. The performance was mixed. The fountain pens feathered and bled quite a bit. More than I am comfortable with or would be happy using. 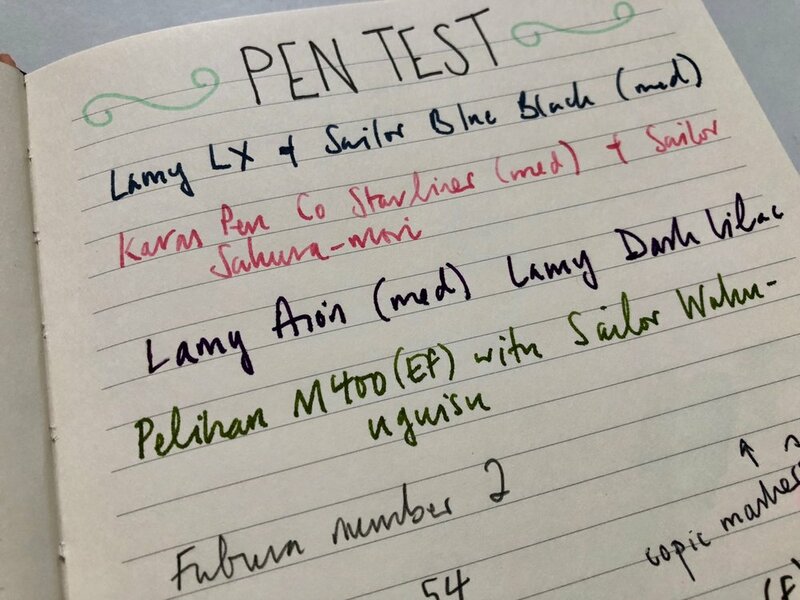 The paper is 100gsm and should be able to handle the fountain pens a little better. With the feathering came some show through which again I would expect. This doesn’t bother me too much personally but it’s worth noting. All the other tools worked well. Pencils were nice on the page, their glided over the paper so there was very little tooth. Drawing pens and liquid ink pens were nice too. Gel pens were a little scratchy but I find that a lot with these types of pen and paper combos. I did also throw a Copic marker at the paper too to see what happened and as expected there was loads of bleed through. The style and design of these notebooks is nice. The hardbound covers feel traditional and sturdy, perhaps a little too much. They add bulk to the notebook and don’t exactly make it slim line. I can see people being attracted to the design and colour schemes chosen and honestly I don’t think you’d be super disappointed if you were to receive this notebook as a gift. However I think it falls short in a few areas and for a similar price point at £12.99 I think there are better alternatives available. However despite all this I think it’s great that there are more British companies and brands producing paper products. Thank you again to Foyles for sending me over their notebook to review.